Our "I "Heart" My Security Specialist" is the perfect shirt for your wife, girlfriend and daughters. It is a ladies t-shirt so it is NOT a unisex t-shirt, so notice the measurements. Full black front print on a fuschia pink short sleeve t-shirt. Large Sizes: Chest 22" Body Length 27" Sleeve Length 15.5"
X-Large Sizes: Chest 24" Body Length 28" Sleeve Length 16.5"
Sleeve Length starts at center of neck and measured down the shoulder to hem. 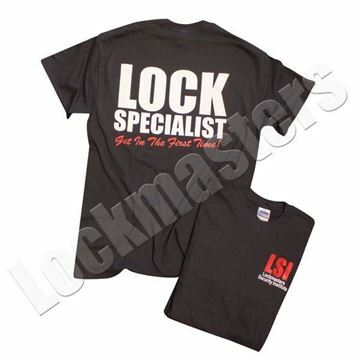 Copyright © 2019 Lockmasters Web Store. All rights reserved.